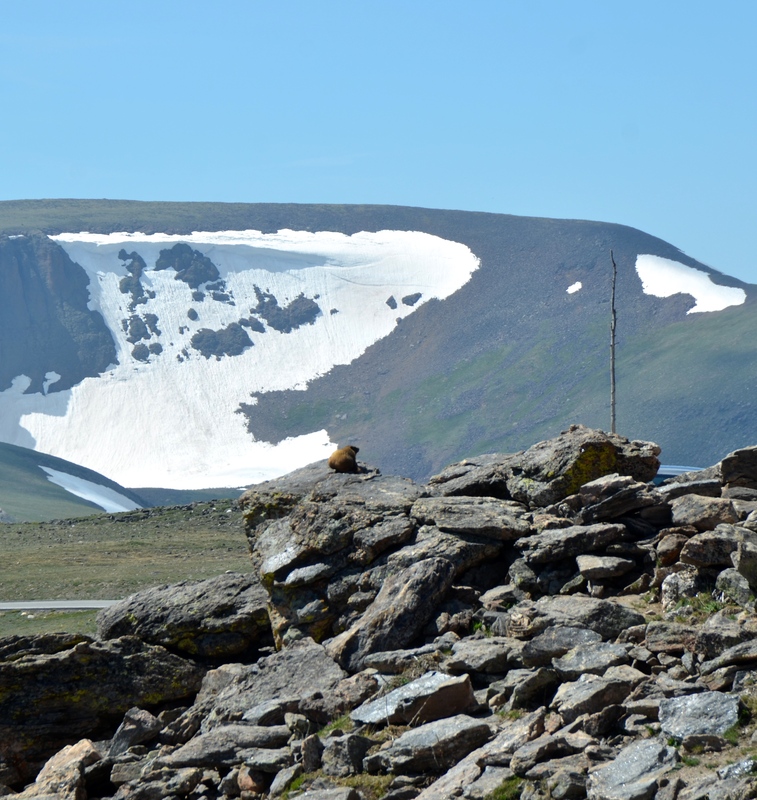 What a view when you stop at a STOP sign at a pull off near Trail Ridge Road in the Rocky Mountain National Park in Colorado. 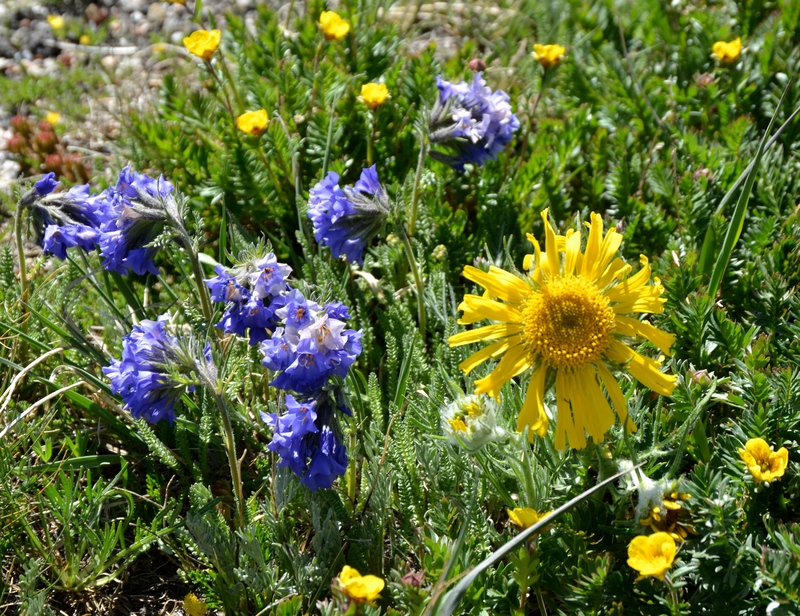 Blue and yellow predominate with Alpine Avens, Rydbergia and Sky Pilot bursting into bloom as the snow melts to allow the plants enough time to set and disperse their seeds before the onset of another long winter spent underground. 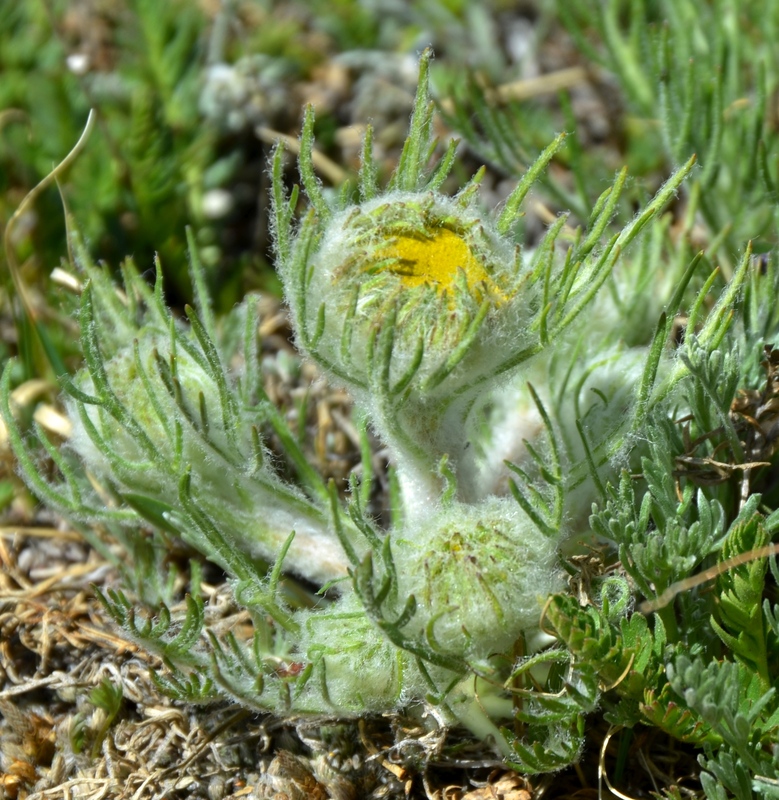 Miniature plants battle the extreme weather conditions found at 12, 110 feet. Nestled into the rock crevices they find protection from eight months of below freezing temperatures, biting winds and extreme solar radiation. Potentilla nivea or Snow Cinquefoil is a tiny member of the Rosaceae family. 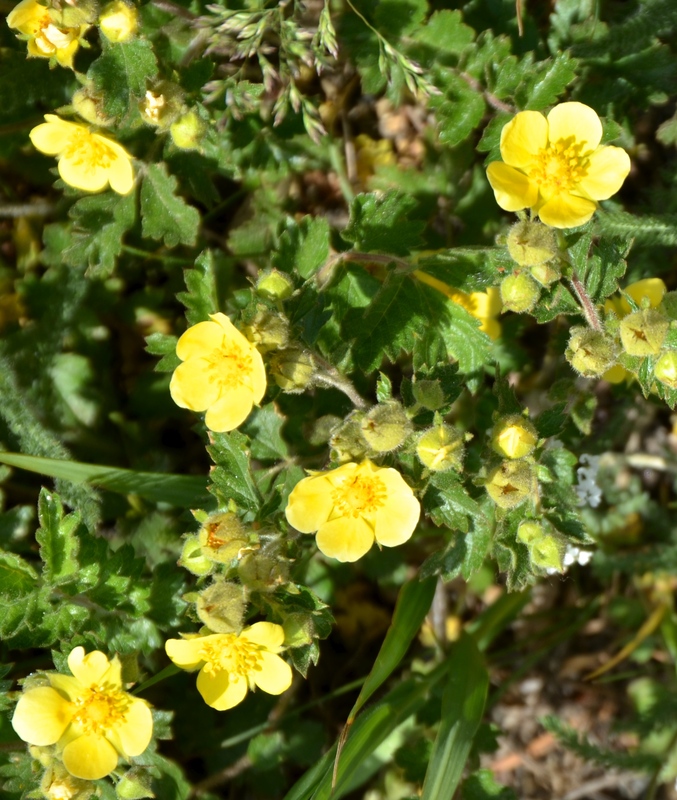 Cinquefoil has (not surprisingly) 5-petalled flowers. Below the flower are 5 sepals alternating with 5 bracts. Fuzzy leaves with white hairs reflect the heat and light when it is not covered by snow. 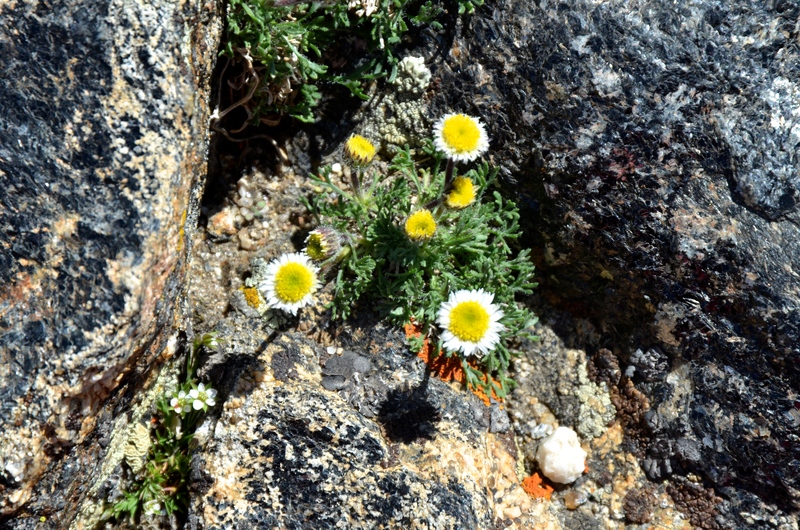 Erigeron compositus or Dwarf mountain/cut-leaved fleabane was first collected in America by Lewis and Clark on their expedition across the continent. Notice that the ray florets are shorter than in some members of this species. 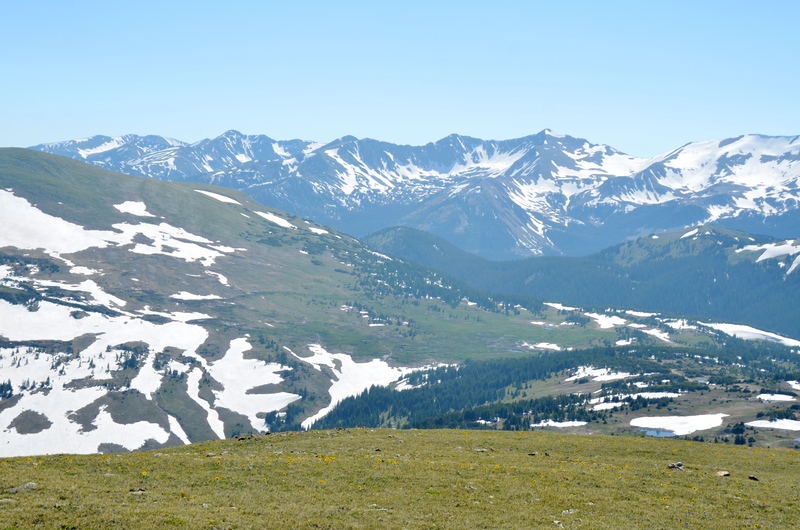 General view out over the Gore Range from the Trail Ridge Road (Photograph taken July 1st – note how much snow is still present). 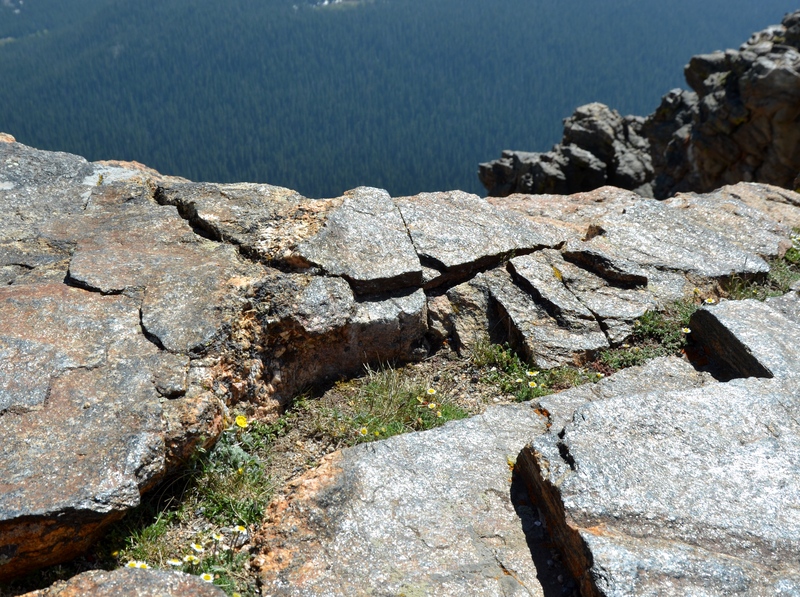 At over 12,000 feet the vegetation is described as Alpine tundra. Trees cannot survive at this height. In the Alpine Tundra perennial plants form tufted cushions or mats of foliage. The height of the stem is usually only 1-3 inches but the roots are very long (measured in feet) to anchor the plant and provide moisture. 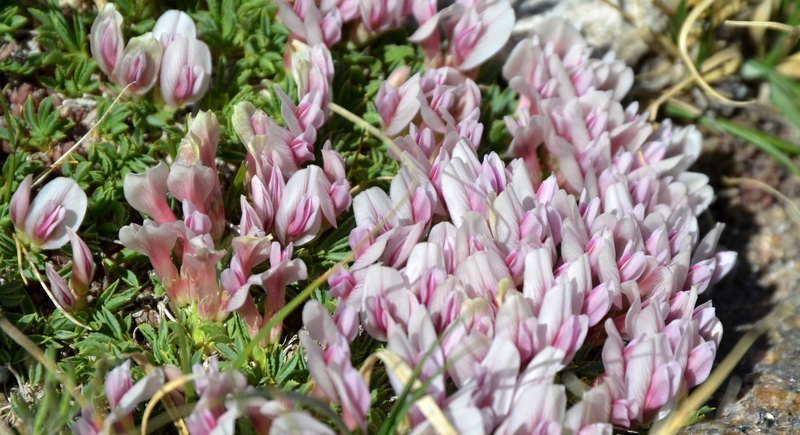 Trifolium nanum or Deer Clover is a member of the Pea family (Fabaceae). At about one inch tall it is easy to overlook. 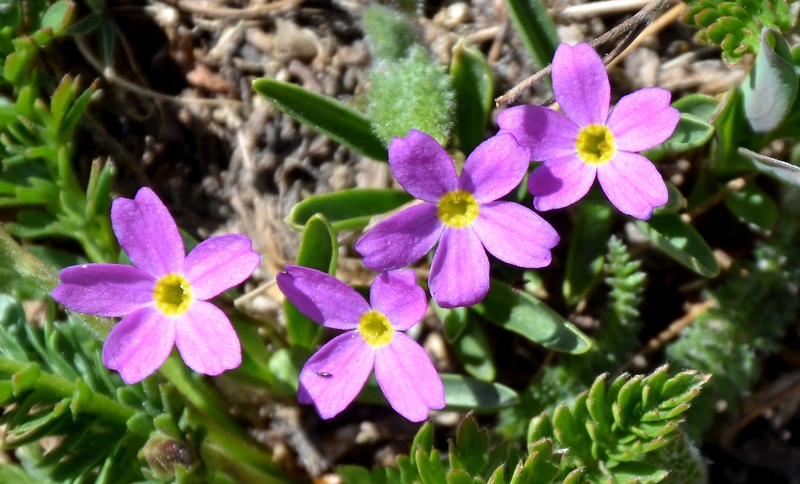 Primula angustifolia or Alpine Primrose is another minute treasure. This plant is sometimes called Fairy Primrose and standing at just two inches high it is easy to see why. Gardening on the East Coast of America makes identification of western wildflowers a real challenge, but I was sure that this was a Mertensia, closely related to our Eastern Virginia Bluebells. 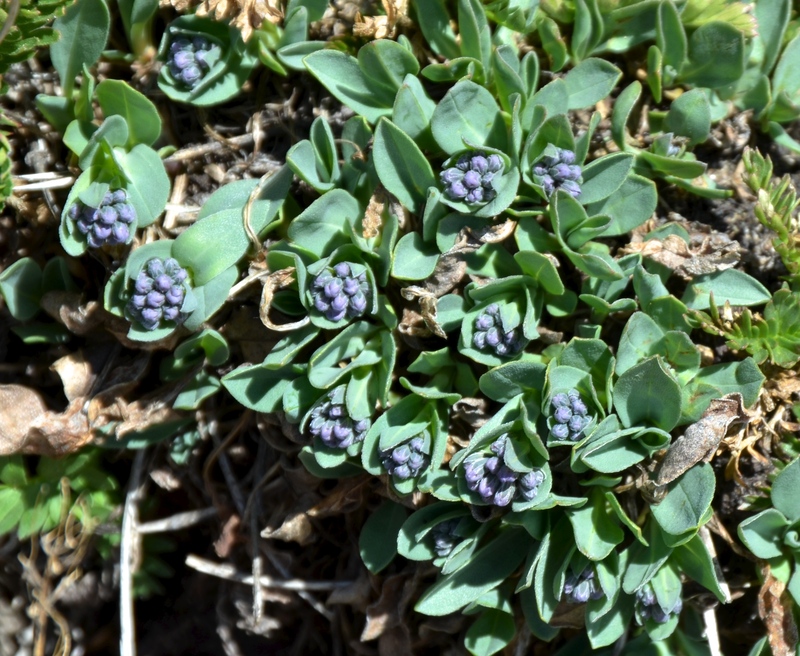 This is a smaller plant called Mertensia alpina, Alpine Bluebells, just about to open its flowers. This is the plant of many names. 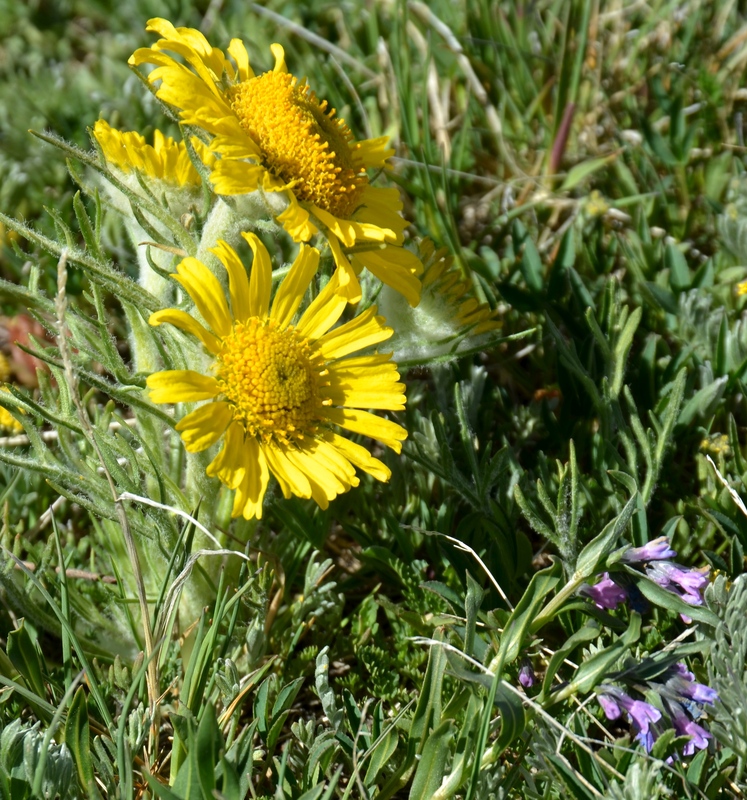 Common names include Old-man-of-the-mountain and Alpine Sunflower. Latin names are even more confusing. Depending which source you use it could be Tetraneuris grandiflora, Hymenoxis grandiflora, or my favorite Rydbergia grandiflora. At least all of the names agree that this plant is a “grandiflora”. The flower is nearly bigger than the stem. The very silvery hairs cover the leaves and stem. Old- man-of -the-mountain looking less like a white-bearded man and more like an Alpine Sunflower. The head of the over-sized flower faces towards the East away from the strong winds from the West. Mertensia alpina flowers opening bottom right. Rydbergia (large yellow composite flower) with the intensely blue/purple clustered flowers of Polemonium viscosum or Sky Pilot / Skunkweed. Sky Pilot is related to our Eastern American wildflower- Jacob’s Ladder. 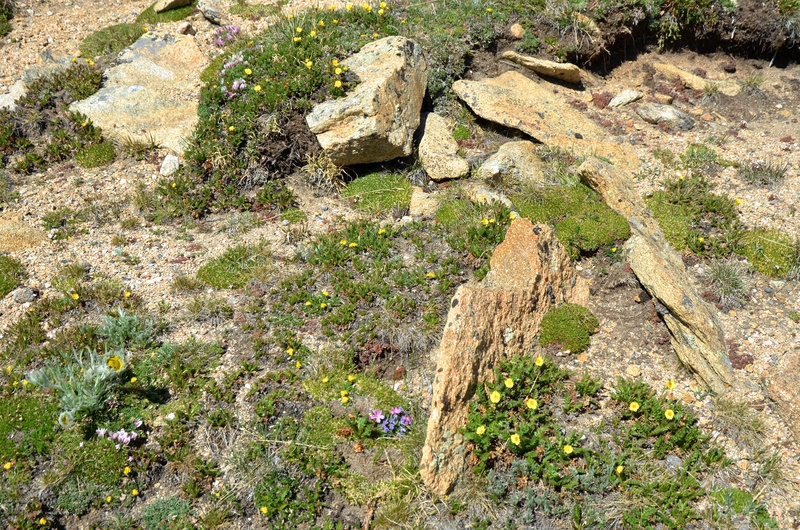 Bottom right the small yellow Alpine Avens (Geum rossii / Acomastylis rossii turbinata). 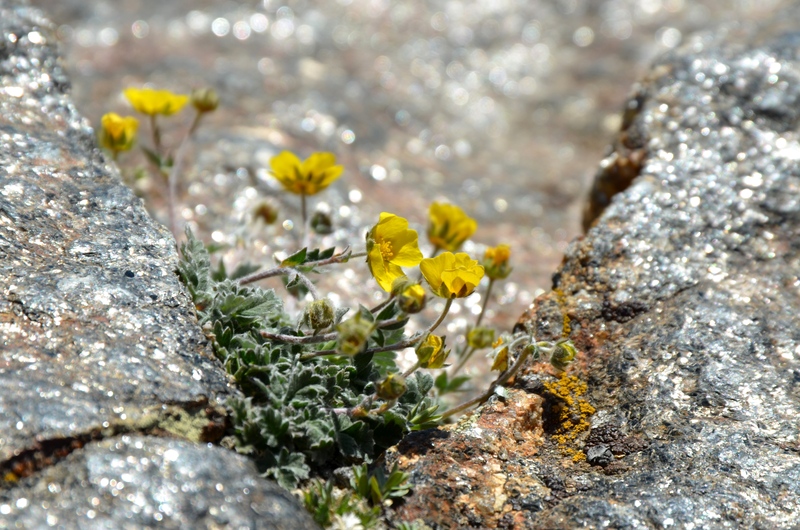 Alpine Avens is abundant in the Alpine Tundra ecosystem of the higher Rocky Mountains in Colorado. The plant has five yellow petals and five sepals. Foliage is ferny and dissected. Height is shorter in more exposed locations. 2014 – The year with no Hydrangea Flowers?